Taking a small child out with you on errands or trips to the park can already be rough, so just imagine the struggle of being a parent of two young kids. Even with the help of a stroller to rein in an energetic toddler, you might still have an excited school-age kid that might just be too thrilled to be out and about with everyone. Both kids will certainly be a handful, but with the right baby gear, you can definitely make it through. If you’re thinking about how hard it would be to balance a double stroller with kids of different sizes as passengers, you’re not exactly wrong. Even the finest ones that can deal with weight imbalance will still be a challenge to maneuver because of their wideness. So a good alternative would be the best sit and stand strollers. As these products offer ample space to carry two kids comfortably, and parents won’t have to struggle to keep their kids nearby while out and about. They also offer easier maneuverability, guaranteeing the children’s safety at all times. Want to get to know some of the best sit and stand strollers in the market today? Here are six of our top picks that you might find helpful in your own search for the right unit for your little ones. 1. Look for safety features. 2. Be very particular about the weight limit. 3. Check recalls before anything else. The Baby Trend Sit N Stand Ultra Tandem Stroller is said to be the very unit that started the sit and stand trend, offering great convenience for parents who need to herd two kids at once on outings with the little ones. So being the original sit and stand stroller, you can bet that you can rely on this product to move around town with your kiddos with great ease. Parents will love a lot of things that this product offers, but its roominess is its major draw. It offers ample space for both kids to get comfortable in, which is important to ensure that both kids’ needs are catered to properly. One of the major worries about sit and stand strollers is that the older child may have little room to move in, but for this unit, you don’t have to fret about them feeling squeezed into their seat. What's Great About It: Aside from its convenience, lots of parents also appreciate how versatile this product is. You can actually configure it in so many ways that you can always try something new to help you bond and entertain your children while you’re out and about. As it’s also travel system-ready, you can easily strap your infant car seat right into the front stroller seat or above the back seat. You can even use it with two car seats in one go, making it earn its “tandem” title. The Graco Roomfor2 is also an excellent option for your little ones. If you already have a Graco infant car seat, this product will be the perfect choice for you, as it is travel system-ready, giving you more bang for your buck. While this item and the Sit n Stand have lots of similar features, a good deal of buyers says that what made them choose this Graco product is its easier maneuverability. Pushing sit and stand strollers is a challenge with two kids in it, so if a unit makes it easier to move around, that can be a solid deciding factor for many. What's Great About It: Made with the busy parent in mind, this product is also loved for how easy it is to configure. Its one-hand fold makes it very easy to stow away, even as you carry your little one in one arm. Both seat cushions are also removable and machine-washable so you won’t have to spend hours cleaning up in case an accident took place while your little one was in the stroller. 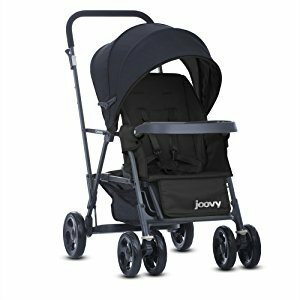 Noted for being one of the most compact sit and stand strollers, the Joovy Caboose can be your top choice if you’re not too fond of carrying bulky strollers, even when they’re already folded. It’s also a few inches shorter than its competitors, so it’s easier to control, even with heavy cargo on board. 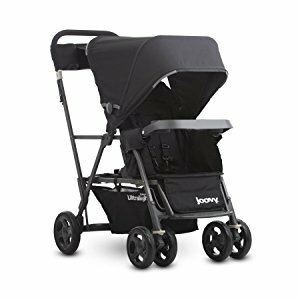 While it still has the same basic design as other sit and stand strollers, this product actually differs from the rest because of its extras. You can get a front-facing rear seat addition, known as the “Too,” for this unit so you can turn it into a tandem stroller if your little ones don't enjoy standing while being carted around just yet. What's Great About It: What really makes the Joovy Caboose a fantastic option is its four-wheel suspension. Not a lot of sit and stand strollers have this feature, so it’s a major plus for this entry-level model. It guarantees a smoother ride for your little ones, ensuring that they’ll be comfortable while they’re on the stroller. Another great sit and stand option from the Joovy brand is the Caboose Ultralight. This model shouldn’t be confused with the Caboose, as the Ultralight is a step up from the former. It shares most features with the Caboose, however, so if you liked that product, there’s a good chance that you’ll love this, too. A lot of parents are willing to spend extra for this unit not just because of its lighter weight, but also because it readily comes with some accessories that are separately sold for the Caboose. 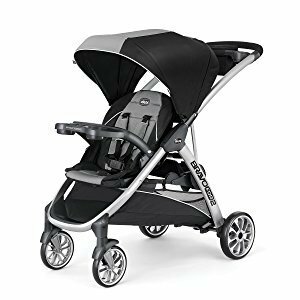 This model is sold with the parent console, a larger canopy, a universal adapter, and a three-position recline, most of which are truly worth the few extra bucks. What's Great About It: As its name suggests, it’s lighter by a few pounds than the Caboose, making it a solid choice for those who can’t handle too much weight, even if they only have to push it around. Thanks to its use of aircraft-grade metal, it’s capable of shedding a few pounds without sacrificing durability. Being the lightest unit on the list, you can be sure that it’s a good option if you don’t want anything unnecessary to weigh you down and make moving around with your kids harder than it already is. If you’ve fallen in love with how stylish Chicco’s Bravo stroller is, then you’ll also love the BravoFor2 for your adorable kids. This sit and stand stroller took the classic Bravo and made some tweaks to accommodate a second rider, making it a more practical option for bigger families without having to compromise their aesthetic choices. It looks great and offers a good deal of extras, which makes it a great investment for most growing households. Compatible with the Chicco KeyFit and KeyFit 2 car seat, this unit is also very ready to double as a travel system. All you need to do is to push the stroller seat forward and place the car seat behind, and it will automatically lock into place with an audible click ensuring that it will sit there safely as you cart both kids around with ease. What's Great About It: What will make you choose this product over other options is the fact that it is designed to offer quite a few amenities to your bigger child as well. The oversized canopy extends back so your older child can also get some coverage on a sunny day. The back seat can also fold up when not in use, so your child won’t have to feel squeezed into his standing space when he doesn’t want to sit down. The Joovy Big Caboose takes things up a notch. Designed to carry three kids around, it’s definitely one of the top choices you can go for if you have three young children who are around the same age. Great for twins and an older sibling or three young kiddos in different ages, this stroller is guaranteed to make outings with multiple children more manageable. Designed with two front-facing seats and one rear seat and platform, the Big Caboose can handle a total of 125 pounds. It will be a lot to push around, but it will be easier to do than pushing a stroller with one hand and holding another child with the other. What's Great About It: Aside from its capacity to hold more kids, it’s also very versatile, as both stroller seats can accommodate compatible car seats without a hitch. You can configure it in so many ways that you won’t have a hard time finding a comfortable fit for your little ones. It’s also very easy to maneuver. All four wheels have sealed bearings, so even if you have to deal with a heavy load, you don’t need to worry about actually moving around. This easy maneuverability helps make the ride smoother, so even if it’s a hulking thing to push around, your babies will still find it a very comfortable way to move about. 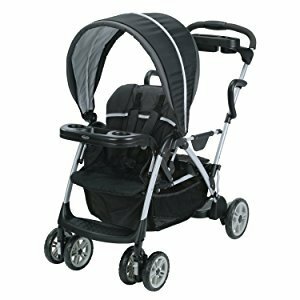 Also referred to by some users as tandem strollers, sit and stand strollers are definitely one of the most interesting types of strollers. They offer more than regular strollers can, so growing families will certainly find them very convenient to have. For the uninitiated, however, this kind of baby gear can still be pretty confusing. So, I'm going to break down the facts to the bare bones to help you get to know these products better. As these products will carry your most precious cargo, you have to make sure that your little ones will be safe at all times. Opt for units with a 5-point harness, easy-to-engage brakes, and high-quality materials. Sit and stand strollers are designed to carry two kids at once, so naturally, it should have a high weight limit, allowing both kids to ride safely. Look for units that are capable of carrying weights of 100 pounds and above so that your kids can get a lot of use out of them. Recalls are fairly common when it comes to strollers, so you have to be on the lookout for them. Especially if you’re planning to buy a second-hand unit, try to find out if the model has already been recalled by manufacturers before paying for it. This way, you won’t be risking your little one’s safety in any way. The first thing that comes to mind when someone looks for a stroller for two kids is a double stroller. Since they’re designed to seat two, it’s just natural that they would be easy solutions for such a need. However, as most units seat kids side by side, there will be a serious imbalance if one of the kids weighs nearly twice as much as the other one. This can result in difficulties in maneuvering and can even falls if the heavier one likes to move a lot in her seat. Of course, this can be easily solved by opting for double strollers that seat kids one in front of another, but with limited access to the sights around, the child in the backseat can easily get fussy and throw a fit. Also, to keep the unit stable, you’ll need to put the bigger child in the back seat, which can mean restricted movements and a higher risks of tantrums. With a sit and stand, however, you have the option of carting around your bigger child without compromising their freedom and your little one’s safety. Both kids’ weights are put in the center of the unit as they sit back to back. Even when your bigger child chooses to stand, the platform is found near the ground, so the dangers of tipping are minimized. Considered to be a quick solution for carting two kids around, sit and stand strollers still have their pros and cons. Before you decide whether it’s a good pick for you, it’s important to take note of the following considerations. If you want to take your kids on outdoor adventures in these strollers, it can be quite hard to find units that can handle different kinds of terrains. Stability can be an issue, as two kids are very heavy to push around, so if your unit isn’t made for traversing uneven paths, don’t risk it. Like in double strollers, controlling a pushchair with a very heavy load can be a challenge. It’s going to take some getting used to and a bit of strength training to push these things with two kids on board, but don't worry — it can be done. As these units aren’t designed to provide the same features for both riders, you can expect that your older child will have to manage without having a sun shade while he sits or stands. Their seating space will also be pretty limited, especially when the smaller one’s seat is reclined, so things can be challenging if they want to nap. If you opted for units that are also travel systems, you should also note that your bigger child might not be able to sit down when the car seat is on board, depending on the unit’s design. These units are designed to lend a hand to parents with multiple kids, so you won’t be hard-pressed to find units that fold very easily. Some are even considered to be umbrella strollers as well, with a single-step folding mechanism that offers the utmost convenience to parents. Being able to cart around two kids in one pushchair unit is already a lifesaver for most parents, but if you have three kids, a need for such is even more pressing. A sit and stand stroller for three kids can work better than a triplet stroller, especially if you have young kids who are close in age, but still greatly varying in weight. Luckily, you’ll be able to find a few three-seater sit and stand strollers, so you won’t have to worry about handling toddlers if you need to run an errand alone. Lay down the rules for your older child. As they’re heavier and can already push the whole unit off, they have to be aware that recklessness can cause serious injuries. 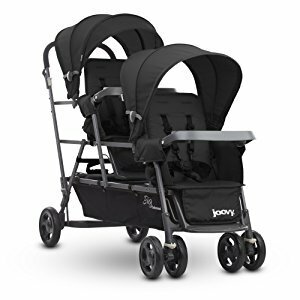 Explain to them that they can’t be too fidgety while riding the stroller, they can’t fiddle with the snaps and other things on the unit, and they have to be careful when getting on and off. 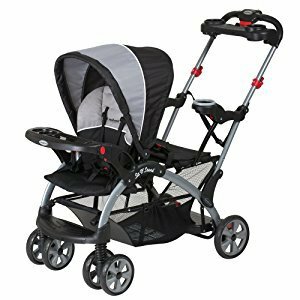 Just like when shopping for other kinds of baby gear, choosing the best sit and stand strollers should be done with great care and consideration. While there are not as many options as there are for other kinds of strollers, picking just one can still be an overwhelming task, especially with your child’s safety to think about. With my quick guide and top-rated suggestions, however, I hope that you were able to narrow down the field and find a few great options to go for.